Milk Chocolate (Sugar, Cocoa Butter, Milk, Chocolate Liquor, Soy Lecithin (An Emulsifier) And Artificial Flavor (Vanillin) Peanuts, Gum Arabic, Corn Syrup, Sugar and Certified Confectioners Glaze. So delicious! My family fights over these. These are the best chocolate covered peanuts I have ever had. Delicious. I will be reordering. When the chocolate covered peanuts arrive my son takes a bag or two and hides them so that nobody else eats them. We all love these! Great taste! Delicious! I ordered one bag just to try them and will order several more. Crunchy nuts and milk chocolate…what’s not to love?! Ordered more and they are so very good. Giving away as gifts! Great deal! Yummy! some of the best I have ever tried! Will be ordering more for sure! Very good. I can never just eat a couple! I quite enjoyed these. The ratio between chocolate to peanut is high. 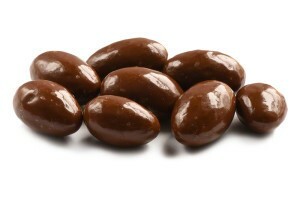 The peanuts also tend to be pretty soft, giving them a more chocolate and peanut butter snack like consistency. I’ve definitely be interesting in trying a dark chocolate roasted peanut that gives it a firmer texture with a less sweet flavor. I ordered these and order came quickly and they are really good. one of the best sellers we have!